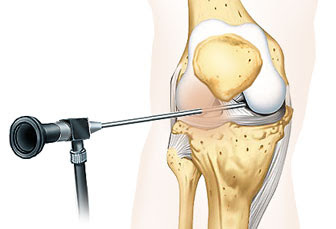 Arthroscopic surgery is a well-established method for treating intraarticular wounds. It can be performed on all big joints, but is usually performed on the knee and shoulder. With a small incision on the skin, a special camera and special instruments are inserted into the joint. With these, damages inside the joint can be identified and fixed. In addition to that, small fractures that involve the articular surface can be restored and supported.